On Tuesday, 07 May 2013 Tyron Zoutman, a former Northlink College student, dynamic performing artist and newly appointed Northlink Dance Lecturer was announced the winner of the prestigious BTEC International Student of the Year Award. There were 58 nominations for the award around the world and the judges on the panel said, it was a tough decision to select the overall winner as the standards and quality internationally are very high. Northlink Performing Arts qualification is accredited by Edexcel, a leading UK awarding body, offering a variety of academic and BTEC vocational qualifications in over 90 countries worldwide. As part of Pearson, the world’s foremost learning company they facilitate and help learners reach their full potential. Tyron was born in Paarl, but grew up in Piketberg, where he was raised by his mother after he endured the loss of his father at a young age. Zoutman comes from a family of singers and dancers therefore he gained exposure to performing at a very tender age and his mother was a very talented writer in her own right. She strongly influenced and motivated him to do well. He was first spotted in a choir at Steynville Primary where he was approached to take the lead role in a concert and it just got better for him from then on. Zoutman was very proud when he heard the news. “I was so excited and couldn’t believe I won, it still hasn’t sunk in yet,” said Tyron. If he didn’t do drama, he would have done Fashion Design, Home Economics, Hospitality or become a Teacher. 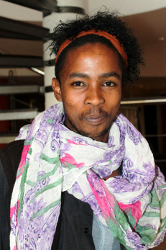 Tyron is now a Dance Lecturer at Northlink College. However, in future he would like to do Broadway Shows and more teaching. Some of the favourite moments in pursuing this career over the years are in Acting: Fin op sy Eiland, a children’s musical; Dancing: Piketberg dance Eidstedfords – Western Cape Movement Education Association (WCMEA) at Steynville Secondary and Singing: Joseph and his Amazing Technicolour Dreamcoat– Lead role. “We are very proud of Tyron for making the best of every opportunity. He deserves this (and other accolades), but above all he deserves the big break into a very challenging industry,” said Kobus Hanekom, Performing Arts Lecturer at Northlink’s Tygerberg Campus. He is highly esteemed by his peers, some are now his students and lecturing staff where he teaches. Some of his hidden talents are: basic piano, Bonjo/African drums and cooking. Tyron specialise in all genres music, but loves contemporary. “No matter where you come from, hard work and dedication to the course is what is important in order to reach success. Follow your heart and do what you are passionate about,” added Tyron. On Friday, 24 May 2013 he graduated and received his Diploma in Performing Arts at the Northlink College Annual Student Award Ceremony. “I am confident that everyone will agree that Tyron is a worthy winner of the BTEC International Student Award and I am delighted for him and Northlink College for this wonderful achievement,” said Manos Kapterian, Managing Director, Pearson Qualifications International. Tyron will be taking flight to London on 04 July 2013 to receive the BTEC International Student of the Year Award in London.